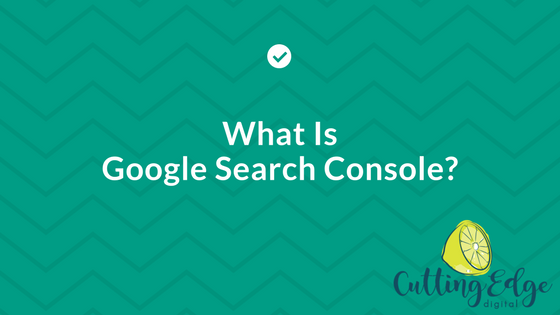 Cutting Edge Digital / SEO / What Is Google Search Console? Whenever I take on a new client, whether it’s for SEO or Google AdWords, I always check and see if their Google Search Console account has been set up and optimised. And I’m always surprised at how many people have not set up their Google Search Console. It’s a key tool which every website should have set up from the moment they launch, but so many people don’t do this. It’s probably more a lack of knowledge when it comes to web designers, as their focus is on building the website and making it look good, whereas an SEO wants to make your website get loved by Google. This is where Google Search Console becomes invaluable. Google Search Console used to be known as Google Webmaster Tools. Google changed the name back in 2015 as it wanted the tool to be more widely used by website owners. With a name like Webmaster Tools, it conjured up images of being super technical and needing some fancy pants geek to understand what it was and how to use it. It’s an essential tool for every business owner that has a website. It’s completely free to use so there are no excuses not to set this up! It allows Google to communicate with you about your website, and it can often tell you if there are any issues with the way Google sees your site – for example if you have a manual penalty, if your website has had malware or spam issues, or if there are errors within your sitemap or pages. What Are Some Key Features Of Google Search Console? You can submit a sitemap which essentially tells Google about all the pages on your website that you want it to index (be able to find and return as search results). You can submit a sitemap through the ‘Crawl’ section. It allows you to check what your robots.txt file is telling Google – this file sits on the back end of your website and can tell Google not to index certain pages of your website – for example your website login URL or your shopping cart URL if you have an e-commerce site. If you see ANYTHING OTHER THAN THIS, contact me! It means you have a problem with your website and Google is penalising it which not NOT where you want to be. This is a great place to check on a fairly regular basis – it’s where Google shares with you any errors it’s found on your website, such as error 404 pages where links that used to work are now broken. If you discover any errors here, speak to your web developer about how to get them fixed. This is another great tool that allows you to see exactly how Google sees any given page of your website. Simply pop your URL in, or leave it blank to fetch the home page and click on Fetch. This will appear and if it’s a new page, you can click on ‘Request Indexing’ to ask Google to crawl the page and get it indexed sooner than just waiting around hoping it will be picked up at some point. If you want to see what websites are linking to your website, check out the ‘Links To Your Site’ section. It’s a great way to keep an eye on who is linking to you and making sure they are relevant and/or high quality sites. Having low quality sites linking to yours is not good for your SEO. Some businesses unfortunately are attacked by others with negative link building strategies – this is basically when low quality links are created that link to your site – these could be on what I call dodgy anchor text (the words the link is on) or on dodgy websites – overseas directory style websites, paid links on low quality sites or even adult content sites. I’ve seen it all! If you see any low quality domains that are linking to your website, get in touch with me today to find out how I can help you disavow these links. If you want to keep on eye on whether your site has been hacked, check the Security Issues section. Google will flag any security issues with your website here and normally they will email you to tell you as well – although sometimes there can be a delay from when your website is hacked to receiving the email. These are just some of the helpful features that allow you to communicate with Google about your website, and allow Google to communicate with you as well. Using this information can help you ensure that your website performs as well as possible in Google’s eyes. There are other tools like this for other search engines, for example Bing Webmaster Tools, but as over 90% of Australian search traffic comes via Google, this is the main one I recommend concentrating on if you’re serious about making sure your website is performing to its maximum potential. If you need help setting up and optimising your Google Search Console, then contact me today and let’s chat!